Gaming as an education tool is attracting attention from a number of higher education institutions, including Boston College, Columbia University, and Amherst College, which are supporting an online educational game environment called Immersive Education. Games encourage performance before competency, the opposite of the dominant pedagogy in today’s schools that stress the ability to recite facts in order to pass the test before actually demonstrating competence in a particular domain. Games are problem-solving spaces that cultivate a culture of learning, and learning complexity is an altogether legal drug that humans can’t get enough of. The gamers attitude to failure is “fail early, fail often” if it is in the service of learning something critical to success. Gamers learn to look past the eye candy to solve the underlying puzzle of the quest or mission that they’re on — just the kind of discriminatory abilities that are core 21 Century skills. Games, particularly MMOGs, are highly social systems where players are driven by a common passion or agenda, just as they must be on the cross-functional teams that are cornerstones of today’s globalized businesses. Students at Boston College stumbled across a jackal in the underground chambers of an ancient Egyptian tomb in early December. One student explained that the animal was the god Anubis, who helped transport dead bodies to the underworld. In reality, the students never left the Boston area. They were inside a virtual world where tombs were three-dimensional digital objects and students were represented by avatars. Their trip was showcased at a conference at Harvard University devoted to Immersive Education, a multimillion-dollar project to build virtual-reality software exclusively for education within commercial and nonprofit fantasy spaces like Second Life. The project combines interactive three-dimensional graphics, Web cameras, Internet-based telephony, and other digital media. At the meeting, Aaron E. Walsh, founder of the nonprofit endeavor and an instructor at Boston College, and two other researchers showed a gathering of about 40 people how virtual spaces can do more than entertain. Their goal is to build three-dimensional, interactive lessons that will grab students' attention in the same way that popular computer games like World of Warcraft do — but without the violence and titillation associated with many online games. "It's important to allow educators to mix and match media types to construct a virtual learning environment that's right for their students," said Mr. Walsh. Some critics have complained that promoting video games in schools and colleges dumbs down education. Yet Immersive Education has gathered an impressive roster of backers. In addition to Boston College and Harvard University, its supporters include Amherst College, Columbia University, Massachusetts Institute of Technology, Sweden's Royal Institute of Technology, Japan's University of Aizu, the Israeli Association of Grid Technologies, NASA, Sun Microsystems, the City of Boston, and the New Media Consortium, a higher-education technology group. Colleges are developing educational games on their own, too. Parsons the New School for Design, in New York, announced last month it was starting a laboratory to create games that might promote social change and civic participation. The Immersive Education project is about to get additional financial support from the Ewing Marion Kauffman Foundation, Mr. Walsh announced at the conference. The foundation has agreed to provide $750,000 to the Federation of American Scientists for the development of online games and virtual environments. Part of the money will go toward developing Immersive Education software's technical specifications and documentation. The science federation, which has worked with universities to develop educational video games, will also continue that kind of work with his project, Mr. Walsh said. Immersive Education builds on Mr. Walsh's experience, beginning in 2001, with online teaching. He was working with Boston College students on ways to build virtual three-dimensional objects. In 2003, after virtual worlds like Unreal Tournament started using a new game engine that allowed players to speak to one another, he began holding his classes completely online. Mr. Walsh developed a prototype of Immersive Education in 2001. He was motivated to create an educationally oriented virtual-reality space, in large part to discourage students from viewing the sexual content of virtual worlds like Second Life and the violence in online games like Gears of War and Crysis. Now his educational environment is moving into its third generation, which will allow high-resolution graphics, more realistic avatars, the use of Web cameras, and the sharing of documents. Avatars are becoming less cartoonish and more lifelike, Mr. Walsh said at the conference. He showed how the faces of some avatars, contorting into various expressions, were nearly indistinguishable from the faces of the real people they were modeled after. 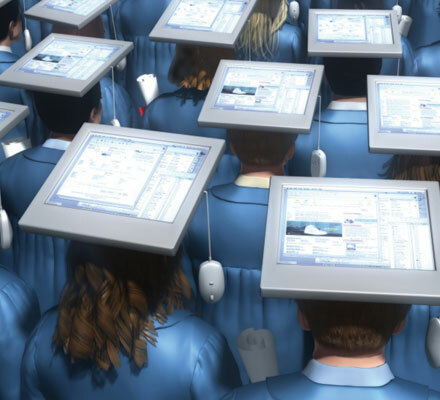 The avatars can greatly improve online communication among students and professors, he added. At the Cambridge meeting, the audience watched the avatars created by some of Mr. Walsh's students take their trips inside the Egyptian tomb. The event took place inside Second Life, but the tomb was created with digital media from a variety of sources, including the Theban Mapping Project, based at the American University in Cairo. This technology can be used to create interactive lessons within Second Life and other virtual spaces called Croquet and Project Wonderland, Mr. Walsh said. Those three environments make their code freely available to the public, so people can easily tailor the environments to their own needs. Gene Koo, a fellow at the Berkman Center for Internet & Society at Harvard Law School, followed up on that point. At the meeting, he described how students at Emerson College and Boston residents were using Second Life to foster civic engagement. They are using the virtual world to design real public spaces, including a park that will be located near Harvard's campus expansion in the Allston neighborhood. And they recreated Boston's subway system to provide tours of the city's neighborhoods. Their Boston Island in Second Life was formally presented to the city's mayor.